A Lovely Rising is a 3 day, 2 night yoga retreat for plus size bodies. Hosted by More to Love at the Kripalu Center for Yoga & Health in Massachusetts. 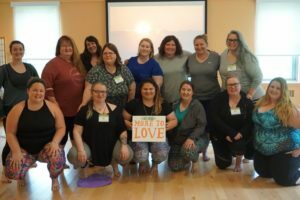 A lovely rising retreat takes place June 3-5, 2019. I WANT TO ATTEND THE RETREAT! Led by Rachel Estapa, founder of More to Love, A Lovely Rising will allow you to release your fears and insecurities about your body as you rise up and own your richest level of wholeness. Let your insecurities vanish as you experiencing a whole-body freedom you’ve been craving for so long. Perched within the peaceful woods of the Berkshire Mountains, overlooking the shores of a glimmering lake, Kripalu Center for Yoga & Health is the epitome of solace, relaxation, and deep personal renewal. Here, your home is a sprawling campus devoted to nourishing the body, heart and soul. Wander the miles of pristine woods in quiet thought; ease into a bubbling whirlpool to soak away your stresses; or snuggle up with your favorite book in the calm of a luminous solarium – Kripalu offers you a blissful setting as you experience the A Lovely Rising retreat. During our 3 day, 2 night retreat, you will be cared for and nourished – body, mind and soul. 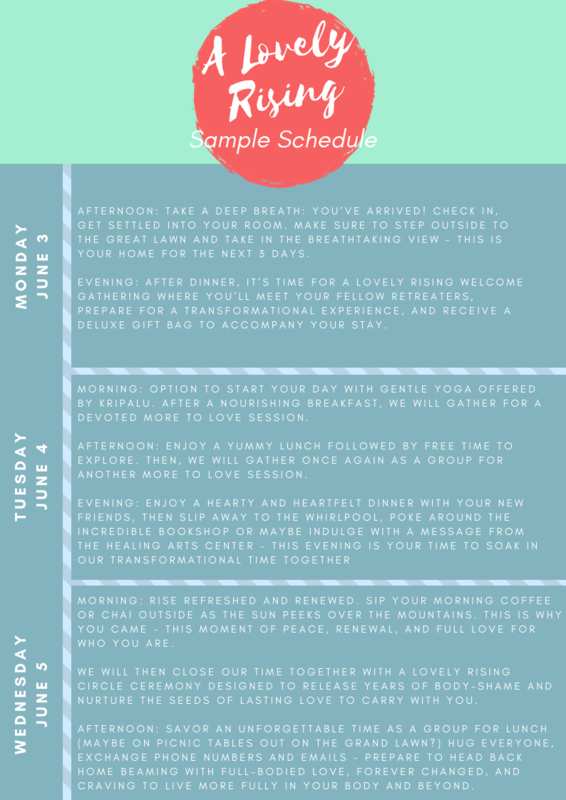 A Lovely Rising will offer private sessions exclusive to More to Love’s retreat members, led by Rachel Estapa of More to Love Yoga. Our retreat’s inclusive activities will cultivate lessons and activities to nurture your self-love and body acceptance. When not gathered as a group, you will have abundant options to deepen your personal retreat through Kripalu’s numerous offerings of yoga classes, workshops, pristine grounds – and so much more! Members also receive a deluxe gift bag, filled with special items to enhance our time together. Here is a working outline for A Lovely Rising. As founder of More to Love, Rachel Estapa provides a safe, supportive, and empowering way to practice yoga and body-acceptance. Rachel’s work focus on weaving together holistic yoga practices alongside More to Love’s core message of body respect and empowerment. 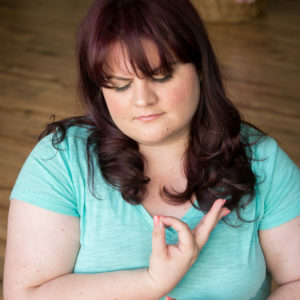 She is a Kripalu trained yoga teacher, Institute for Professional Excellence life coach, and sought-after expert in the area of body-positivity, wellness, and yoga for larger bodied individuals. Rachel is certified Kripalu yoga instructor and transformational life coach, equipped with more than 1,000 professional training hours in the necessary tools to share what she has learned and empower others to love, accept, and care for their bodies and their entire selves. In 2017, Rachel was the Grand Prize winner of Mastercard and Bank of America’s Grow Your Biz Contest, and has been profiled in numerous outlets, including The Boston Globe, USA Today, Huffington Post and many more. She is a sought after teacher and speaker in the field of plus size wellness and is excited to support More to Love’s robust and growing community. More to Love would not exist if not for Kripalu. See, my first visit to this glorious campus was during the same time in my life I chose to let-go of feeling bad about my body. I was ready to live wholly on my terms, but didn’t know how. So I booked a trip on a hope, a whim, that maybe I’ll find what I was craving – liberation. My experience at Kripalu was life-changing. I felt free to be me, confident to move my body without insecurity, I felt ripped open in a loving and glowing way that to this day, still pulses inside. It was a beautiful convergence of my inner world reaching out and the world around me hugging in. Empowered, I soon completed my professional yoga training at Kripalu too, ready to have my work liberate people from body-shame through the power of yoga and personal growth. So it’s only fitting that More to Love’s first destination retreat should be at Kripalu because this impressive setting truly is the “soulful home” for me, for MTL, and soon for you. A 3-day thoughtfully curated A Lovely Rising program led by Rachel Estapa; all meals/beverages during our program; discount off standard Kripalu room accommodation during your stay; additional access to Kripalu’s daily yoga classes; exclusive access to Kripalu’s manicured properties, including state of the art amenities, access to cafe and bookshop; 24-hour access to the dining hall for snacks and teas; on-site parking; and A LOT of positive vibes! Guests are responsible for booking and payment of their on-site Kripalu accommodations based upon your personal preference (please see below for more); transportation to/from Kripalu; Healing Arts appointments; any additional stay added as outside of the A Lovely Rising program. The cost of A Lovely Rising (excluding your travel and accommodations) is $499 in one full payment. The deadline to register is Sunday, May 12, 2019. Attendance will be capped to ensure an intimate and rewarding experience for all, so do not delay on registering. We ask that you commit to the best of your ability to attend this retreat. Of course, unforeseen changes occur and in that event, you will receive a full refund (less a $50 cancellation fee) if requested within ten days of your registration. After that, including any registration completed after April 16, 2019, is non-refundable/non-transferable. Kripalu offers numerous room styles and options available. Attendees are required to stay on site + are responsible for booking their own accommodations. Prices for accommodations vary, but you are awarded a 15% discount off any accommodation when you mention “More to Love”. I’ve also requested a “More to Love Only” dorm room those wanting a cohesive boarding experience, too. Please call Kripalu directly for accommodation options and pricing and/or check here under “all other programs” for estimates. Yes, staying is required as this program is about community, too, and pricing factors in the amazing amenities of Kripalu. The accommodation rates for staying overnight have been discounted exclusively for this retreat. .
You do not have to book your accommodations when you register for the program. However, availability will be first come first serve – especially if you’re opting for a more private room – so don’t wait too long to reserve your accommodations. I have stayed in all types of accommodations offered by Kripalu – from the dorms to the swankier Annex, and still, my preference is the dorms. Why? The beds are super-soft, the rooms and spaces are clean, people are extremely respectful of the rules, and it’s also lovely to meet people from all over. Don’t think of these dorms like campgrounds – they are meant to promote restoration and ease during your stay. This is a retreat center designed to unplug from the world, so best to limit your use of tech as much as possible. Read Kripalu’s policies on tech for more clarity. More to Love has, and will be, open for all bodies and people to participate. That said, More to Love has prided itself as being a special gathering for folks in large bodies. If that’s not you, I just ask you pause and consider before registering “how might my presence impact other’s ability to feel at ease?” Regarding gender, folks identifying as male, female, both or neither, are all welcome. The short answer: this is a retreat…not a yoga bootcamp! Just like More to Love Yoga, this is based on what you want to experience. Any additional activities outside of our planned session is totally up to you. And this experience is not limited to just yoga – you can partake in other types of sessions too which will be posted daily as Kripalu. Please visit the Kripalu website for numerous travel options. Of course! No two More to Love experiences are ever the same. In fact, you likely will be able to take your experience to another level. ALR has been shaped to factor in your feedback from last time, so while some aspects may be familiar, it’s not the same program.